Our 2018 highlights – and plans for 2019! Our new partnership with Eurail / Interrail! Just launched: Spotted by Locals Yerevan! Recommended in Travel + Leisure magazine! 25 new Spotters in 3 months! Spotters meeting all over the place! First app downloads in Bahrain, Kyrgyzstan & Guatemala! Our 67th city guide: Mexico City! Our Dublin blog is shortlisted for Irish Blog Awards! Is our app a “Terrible application” or an “Awful app”? Our Spotters’ National Geographic articles! Why become a Spotter? Our Spotters can tell you! Soon to be launched: our new website! Milestone: 2 Spotters get married! Shout out to some fellow local travel pioneers! How happy are our Spotters? Shortlisted for The Independent Travel Awards! A marathon with Spotters from 6 cities! Our North America trip: City 9 – New York! Our North America trip: City 8 – Boston! Our North America trip: City 7 – Montreal! Our North America trip: City 6 – Toronto! 22 nights in Park Inn – our experiences! Our Europe trip: City 22 – Paris! Our Europe trip: City 21 – Antwerp! Our Europe trip: City 20 – Brussels! Our Europe trip: City 19 – Cologne! Our Europe trip: City 18 – Frankfurt! Our Europe trip: City 17 – Zurich! Our Europe trip: City 16 – Munich! Our Europe trip – City 15: Rome! Our Europe trip – City 14: Milan! Our Europe trip – City 13: Zagreb! Our Europe trip – City 12: Sarajevo! Our Europe trip – City 11: Belgrade! Our Europe trip – City 10: Budapest! We launched Spotted by Locals Philadelphia! Our Europe trip – City 9: Bratislava! Our Europe trip – City 8: Vienna! Our Europe trip – City 7: Prague! Our Europe trip – City 6: Warsaw! Our Europe trip – City 5: Berlin! Our Europe trip – City 4: Oslo! Our Europe trip – City 3: Stockholm! Our Europe trip – City 1: Hamburg! All new iPhone & Android apps! 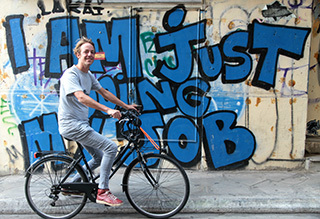 Our 60th blog: Spotted by Locals Thessaloniki! We’ll visit 40+ cities in 2015! Our Spotters at Project Space Festival Berlin! Our Heroes: Pioneer Spotters since 2008! Chicago Spotter Chris on the radio! 44 hours in Riga 2014! Now available: our all new Android app! Spotted by Locals on Google Glass! New release of our iPhone app – iOS 7 proof! A new city guide – Porto Spotted by Locals! We’re in The Culture-ist’s “favorite blogs of 2013” list! A new city guide for a new country: Sarajevo! Finally…. Spotted by Locals Moscow! Just launched: Spotted by Locals Seattle! Just launched: Spotted by Locals Chicago! Copenhagen & Edinburgh Spotter meetup! Meet us at “Act like a local” Brussels! Can you trust review websites? Is our app really 100% offline? Uber – our new private driver in Europe! Testing Google Field Trip – Now available worldwide! San Francisco & New York by KLM! Last stop on our North America tour: NYC! Our Boston city guide is live! Toronto – our latest city guide! We launched our Washington DC guide! Field Trip now available for iPhone! We’ve partnered with Google – meet Field Trip! In Sunday Times top 500 apps in the world! We’re in Times Top 50 Websites for Travel! Which cities in the world have a metro or subway? The 10 most visited Spotter profile pages of 2012! The 10 best read articles of 2012! Amsterdam Spotter Lauren on Belgian TV! Spotters weekend – live blog! Next week: Amsterdam Spotters weekend! Spotted by Locals on ZDF German public television! Our Android app in the media! Spotter applications from around the world! Just launched: Spotted by Locals Saint Petersburg! Trend spotted by Europe Locals – Colorful Macarons! Now available: Spotted by Locals on Android! Now online: Spotted by Locals Skopje! Le Monde spotted Spotted by Locals! Article in Volkskrant Travel section about us! Recommended by The New York Times again! Meeting our Spotters in Krakow! Spotter Katerina in KLM online magazine! Our big meeting with all Spotters – November this year! We’re Ryanair magazine’s favorite Europe travel app! We cover more cities in Europe than the “big 4”! Our brand new look – what do you think? Happy new year – Hug a local in 2012! Tallinn by locals – our latest blog! Our 40th blog: Vilnius by locals! We launched our 39th city: Riga by locals! Coming soon: our new & improved iPhone app! Trend spotted by Europe Locals – Juicy Burgers! 6 days, 5 cities, 20 Spotters! Share Small Great Places with the new Volkswagen up! Book hostels on Spotted by Locals! We just launched a Belgrade cityblog! Publicity in Berliner Morgenpost and Irish TV! Be a Berlin, London or Paris flâneur – from home! Go local, stay in an apartment on your citytrip! Fresh updated iPhone apps & PDF Cityguides! How to Greet Someone in Europe: To Kiss, Hug or Shake Hands? Just launched – Our 100% offline iPhone apps! Our 33rd cityblog – Bucharest by locals! Istanbul by locals – we’re live! Thanks for your support in 2010! New cityblog – guess where these locals are from! Introducing our new hotel booking partner: Splendia! Guardian Best Travel Website award! 30 iPhone apps… coming soon! Launch of Spotted by Locals Ghent! Full page article in Parool! Launch of the Oslo cityblog! Warsaw and Barcelona Spotter meetings! Our 3 week roadtrip to 9 cities in Europe! Our 26th! The Warsaw cityblog! Just launched: the Dublin cityblog! Winner Travel Mole Web Award! Visit Prague like a local! Spotted by Locals on the road!